The challenge of making and/or keeping your blog fresh, exciting, and original isn't always an easy task. I can attest to the fact that reinvention has been a necessity for keeping my blog alive and keeping myself interested. So with that in mind, here are a few things that I've come to appreciate for the sake of my sites originality. 1. Make it personal. No matter what you write about, the more you can relate something to your own experience and viewpoint, the more you'll stand out for bringing your own style forward. Finding a balance between your relationship to the topics you write about helps build a connection with your readers. 2. Fill the void. If you find yourself writing about popular topics on a regular basis, approach them in a way that doesn't seem completely redundant. Look for the areas in those topics that seem lackluster and improve on them. Ask yourself, why would someone read what I'm writing if I do exactly the same thing as everyone else? Why would they search this out? What am I doing that would make this memorable? Create what you're not seeing, but would like to. It's a good lesson and habit to get into. 3. Use imagery. Including your own photos and adding visual ques to the ideas you write about is a great way to engage with readers. It's also something that's immediately recognizable and at first glance will give your posts a look all their own. 4. Answer your own questions. We've all had trouble finding answers from time to time, so share what you know. Personal experience and advice are staples of blogging, so throw your own voice into the mix. 5. Diversify. Whether you blog is about everything or a very specific topic, find subcategories within your content range to give your site more flavour and depth. This can help to break up monotony and keep new ideas flowing. Having a wider range of content gives readers an excuse to explore. 6. Stay genuine. If you're passionate and honest about the things you write and share, there's no doubt that your site will stand out on its own merit. If you're writing for search engines or quick keywords, those posts may get you hits, but they won't inspire those who are actually looking for real content. The more you're able to make a connection, the more likely you are to build a following. 7. Read. Frequent others sites, read books, browse magazines, and see what's going on. Reading will improve your writing, help you with your grammar, and get you more in tune with what's trending. 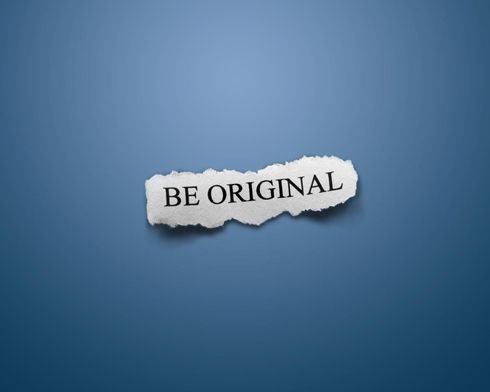 If you want to be original, you're going to need to know how you can bring something new to the discussion. 8. Continually try new things. Once you've found a formula that works for you, try adding a few new ingredients to challenge yourself. Introduce videos, interview other bloggers, or try a post on a completely random topic. The more exciting you make your website for your own sake, the more exciting it's going to be to see what you come up with next. Perfection doesn't actually exist, so if you're not evolving you're moving backwards. This is a wonderful post Luke! The information here is quite practical. I think I'll bookmark this one, as it's likely something I'll want to look back on when/if my blog starts to bore me haha. Thanks for a great, informative post! Agreed, thank you for this help. As a new blogger, this will be a good resource for me. Wow, I totally agree! My blog seems to be more about just everyday life and what/how I'm dealing with it and I've always wondered why I'm not gaining any followers or getting any comments on posts anymore and I have to assume its because nobody is interested in what I have to say. I have always used some of these 10 tips, but maybe i will try the other ones that you have posted. Thanks Luke, this might just help!